Every now and then I manage to get a game with a friend in Harrogate. 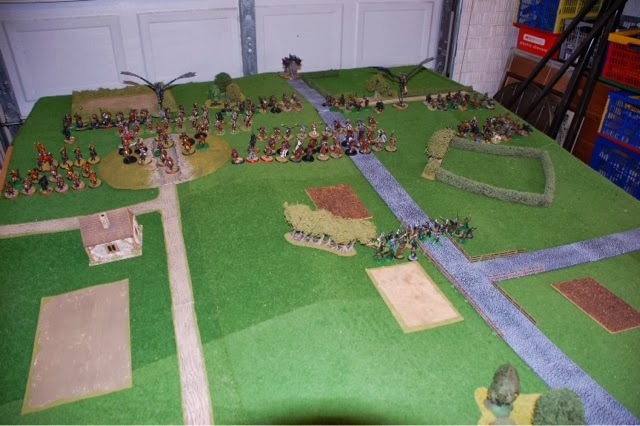 We both love over-sized games of LOTR and in this one played a scenario in which Faramir was retreating from Osgiliath pursued by a horde of evil cavalry. Imrahil and Gandalf led a sortie from Minas Tirith, Theoden led a charge of the Rohirrim who had turned up to the Pelennor slightly early and the Three Hunters turned up with some of the Grey Company. The evil side fielded the Nine, Gothmog and Suladan. We decided that victory points would be awarded for killing key characters, and the survival/death of Faramir and if he died the force that captured his body. In addition the evil side won outright if they got into Minas Tirith. Each side had nearly 200 cavalry. I played the evil side. 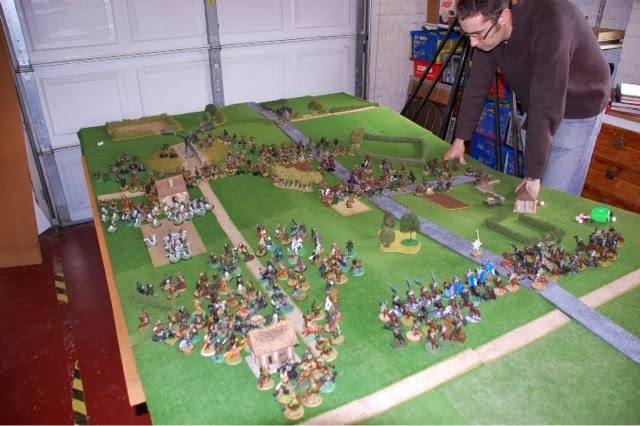 The board was 12' by 6' if I remember correctly and the terrain was all from the collection of my friend Doug (he also provided most of the figures and took most of the photos). The initial evil set up, and Faramir's forlorn retreat. Evil was mainly warg riders with Harad, Khand and Easterling Cavalry present too. The sortie from the city. 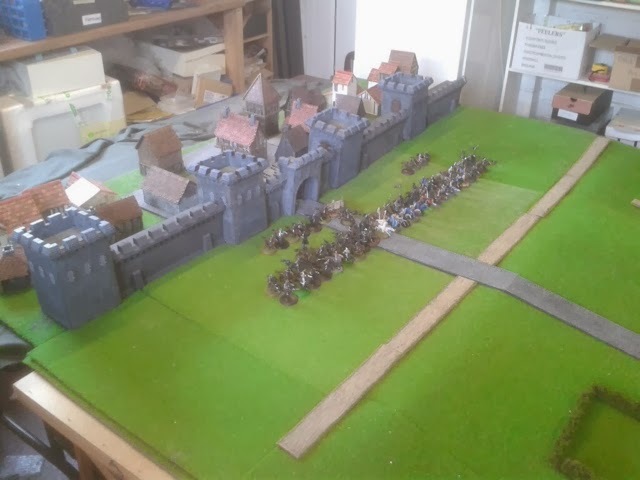 It looks like a small force on this board, but that's 60 cavalry just there! The armies about to clash. Here is where Faramir fell. Two Haradrim dragged off his body whilst the sons of Elrond and Imrahil got bogged down in evil cavalry and the fences. I had great luck with my courage rolls for Wargs, and by the end of the game had 8 riderless Wargs left on the board. Faramir died early on, with a mere Captain of Gondor then knocking Khamul off his fell beast shortly after. if I remember correctly the good side scored points for Khamul, a Ringwraith and Suladan. Evil scored points for Faramir, Aragorn, Gimli, Elrohir, Grimbold. We also killed Eowyn for fun. 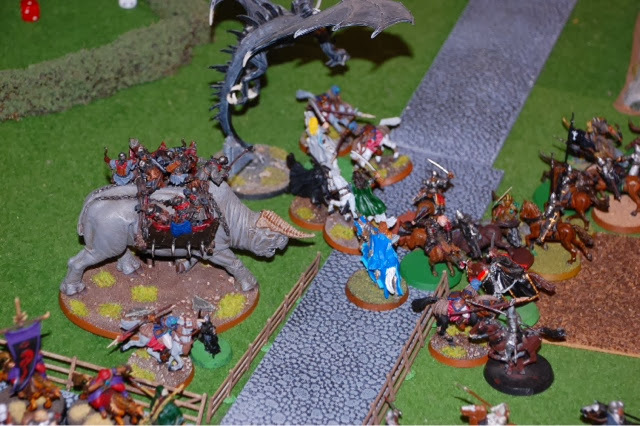 Luckily for me some warg riders managed to squeeze through the line and run for the open gate. Despite the best attempts of some Rohan reserves and a couple of. 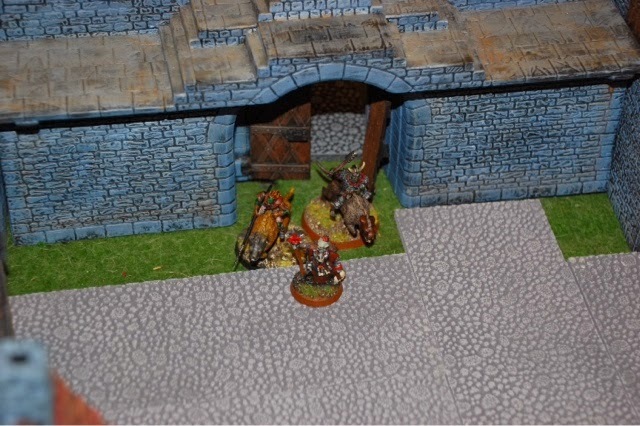 Knights of Minas Tirith the 6 warg riders got away and eventually a captain, a shaman and a warg rider got into the unguarded city. Victory for Mordor! It was a fun game and we were trying to work out a scenario for a bigger mass participation game. In the end we thought nine wraiths made it unfair, although how else are you going to deal with Aragorn, Imrahil, the twins, Eomer etc? Particularly when outnumbered like we were. The starting place for Faramir was tricky too. Too close to the city and it would be too easy to escape, too far and he got mown down too easily. 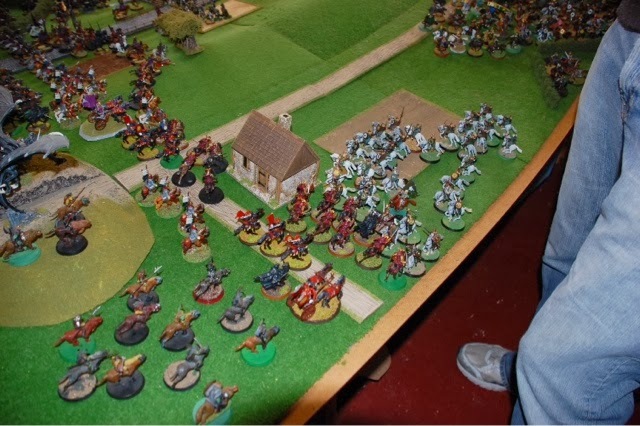 Also the board allowed a wide deployment for the evil force, was this unfair? We'll no doubt play it again at some point and tweak it. I love these mega games, and that the LOTR rules stand up even with such large model counts. I love the scale of game you are putting on here! Big games look cool. I had always pondered your blog title - and had thought the 'US' a reference to America, but if you're in Harrogate (been there a couple of times), then I am off the mark! Keep up the LOTR action! Cheers Scott. It's the megalomaniac in all of us wargamers. 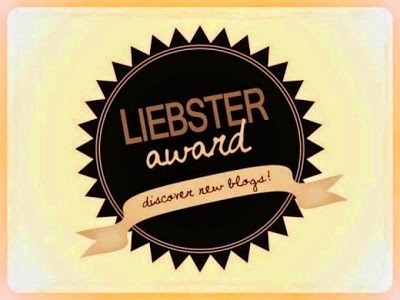 In terms of the blog title - it's a long story, and has nothing to do with wargaming. It's kind of a running joke with my mate Josh who is my usual opponent.